How many films were built around the idea of Martin meanly taking advantage of worshipful idiot Lewis, only slowly returning his respect and friendship? The innocent clown and exploitive straight man was hardly exclusive to M&L (Abbott and Costello the most prominent example), but the sentimental bromance seems to be their own. Stan and Ollie were always a close pair, but once the pants were on Phillip the relationship was anchored from the first frame of every film. There was never a plot built around Stan seeking an uncaring Ollie's approval. The running theme was Martin becoming a better man because of Lewis. One wonders if it was all scriptwriter invention or Jerry imposing a personal fantasy. "The Stooge" explicitly presents Dean as worthless without (unwitting) comic genius Jerry; while that plot was already a bit threadbare by the time they used it the implied mirror of real life couldn't be ignored. Did Martin have anything to say when that story was pitched? For all Jerry's "love" for Dean, I wonder if it ever rankled to be asked about his years with Dean during every interview til the end of his life. Like you, have never been able to sit through any of their movies, but their TV work floors me every time. Has anybody with that kind of nervy, bold, unrepentant energy appeared since? I was too young to see M&L in theaters. I saw M&L's films on TV and I wasn't much enamored though I enjoyed Jerry's slapstick interludes. Around '83 someone gave me a VHS of M&L on the Colgate Comedy Hour. When I received it I thought to myself I can tape over this cassette later. During a blizzard I popped the tape in so I could hoot at M&L. Wow was I wrong. I have never seen a greater difference in a show business act in my life. In front of a live audience these guys were gold. I was laughing out loud at this tape. 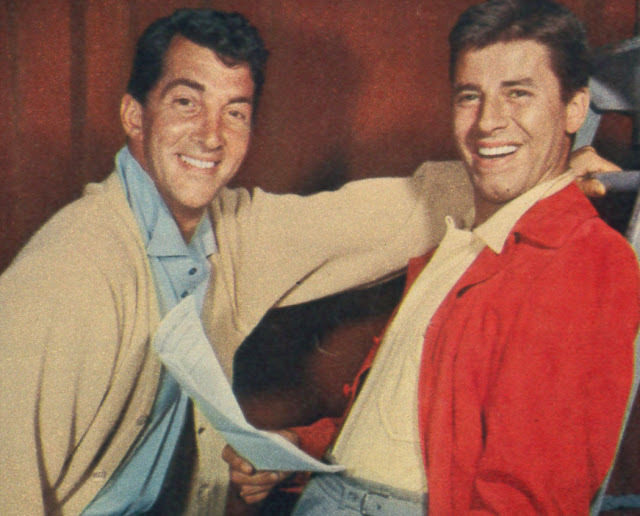 I was amazed to see Dean Martin as one of the best straight men I had seen. He knew when to let Jerry go and when to reel him back in. They had an amazing connectivity with a live audience. A real revelation to me was seeing an early 1960s "Tonight Show" kinescope guest hosted by Jerry. I don't think I've ever spent a more excruciating 90 minutes with a performer. The entire show is Jerry taking over everything, spending most of the show on his "memorization" act. He tries to make a joke of the commercials and even tries to upstage the "Tonight Show" band during the station breaks, doing impromptu slapstick as they play. When they finally get around to a couple of guests, Jerry just can't shut up. It's very revealing about the essence of who Jerry was - he has to be the center of attention, all Jerry, all the time. He can't just stand back and let someone else share or have a spotlight. Dean might have been the only person on the planet that had a strong enough will to make Jerry back off and it even exhausted him. 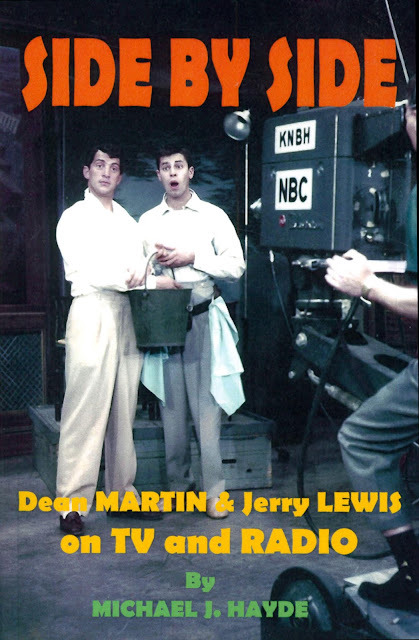 I wasn’t around to experience Martin and Lewis firsthand, but what I do recall was my amazement, knowing them first solo, at the discovery that they could have ever been a team! “How could that have worked?” I thought, it was like I had found out that Frank Sinatra and Pinky Lee had been a team in the amount of sense it made. Then, of course I saw the films, and later the kinescopes, and the main thing that always stood out was just how important Dean Martin was to making that work, he was the real anchor that kept some sort of solid structure to Lewis’s “hey, look at me Ma!”(or audience) antics. Think not? 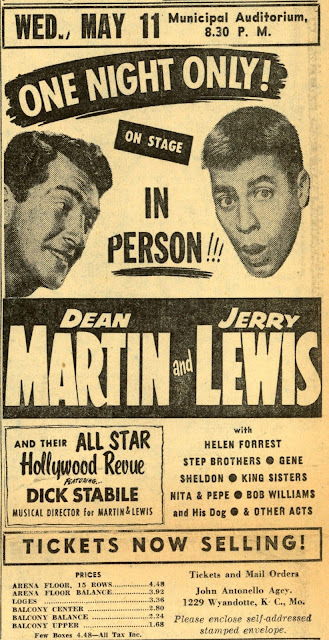 Ever see Jerry Lewis perform live solo? Jerry Lewis’s schtick really only works with some sort of partner, otherwise it was just a weird guy with his hair slicked back in an Armani suit and rolex warch ruining the microphone by putting it in his mouth. And as far as the films go, the irony is that they get better at the end when they weren’t speaking to each other, I’ll take ARTISTS AND MODELS, PARDNERS, and HOLLYWOOD OR BUST over any of the military pics, or SCARED STIFF (even with George Marshall retreading them though THE GHOST BREAKERS, all it shows is how good the Bob Hope version (possibly Bob’s best film) really is, and somewhere by the last third, I’m ready to drop a 16-ton weight on Lewis if I hear him cry “LARRRRRRRY” one more time). The auteurists can shout “Frank Tashlin” all they want, but it’s more than that (and Norman Z. McLeod does just fine on the western spoof), I think it is more that Lewis holds himself more in check when he perhaps realized that his partner had had enough of him. The whole thing that stops Jerry Lewis from being a genius to anyone but the French is that little word and character trait called “discipline”. Whenever later on Lewis managed to exhibit even a smidgen of it, one got THE NUTTY PROFESSOR, or THE KING OF COMEDY, the rest of the time, one just misses Dean, who brought any discipline to the team that it ever had, as well as the ability to be quick-witted enough to deal with, react, and even top what Jerry threw at him. Michael's new book is on my radar for a near future read. I've read every book about Dean or Jerry or Dean and Jerry. I did grow up with their movies and loved them, sure, some better than others. When we played Hollywood or Bust at our drive-in theatre in 1956, my mother told me they weren't going to make any more movies together. I cried. I was six. I stayed with Jerry's solos and Dean faded away since he wasn't making "kids" movies. But when The Family Jewels rolled around, I was done with Jer features and gravitated back to Dean. I was a young teen by that time and felt I was too old for Jerry, Elvis or Disney films. Sure, Jer was a Jerk, but he has always fascinated me like no other show biz guy. And to this day, I idolize Dino. So 52 years after their split. I remain a Dean Martin, Jerry Lewis, Dean Martin and Jerry Lewis fan. Hey, they ruled the roost in every facet of show biz for ten years. Not many have done that. Acting opposite that late, great Lynn Redgrave, I was concerned about a bit of business I'd been given by the director. "If I cross on that line," I said to her, "I'm afraid I might upstage you." Without missing a beat she replied, "You can't scare me -- I worked with Jerry Lewis." She later told me that all through rehearsals for HELLZAPOPPIN'! they were best buddies, the two couples dining together every night and becoming fast friends. Then, in the first out of town preview, she got laughs in places Lewis hadn't expected her to. "He never spoke to me offstage again," she reported. She also told me something about show business that I've never forgotten. "Of all the people I've worked with, the ones who were total sh*ts were also absolutely terrified," a generous and productive way of looking at the sh*ts in this business, one which I have tried to adopt ever since. I too, like Mike find Jerry fascinating. He is at the crossroads of so much of mid 20th century show business mythology. He and Dean are at the forefront of the rise of the post war Night Club/Las Vegas era. Dean and Jerry were really like comedy rock stars. Nothing had preceded that kind of popularity. 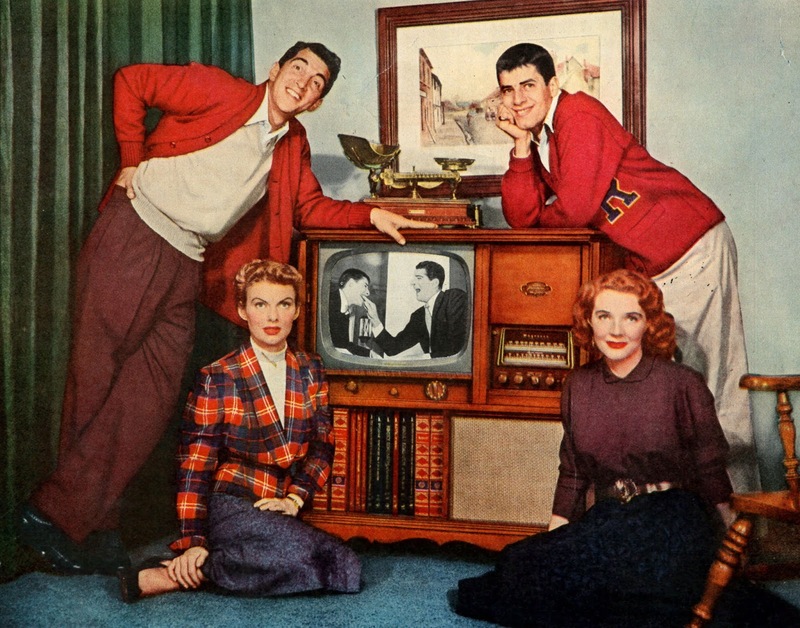 It could be said that Jerry, along with Sid Caesar introduces Borscht Belt comedy to mainstream America. And then it could also be said that Jerry, along with Blake Edwards are the last of a certain tradition of cinema comedy directors, that Mel Brooks and Woody Allen are not part of, that starts in the silent era. The thought of Lewis directing someone else is like Chaplin or Keaton directing others. One More Time proves this. The career spans the Borscht Belt, strip joints, fancy night clubs, large venues, radio, movies, records, and television. And though he lives to be over 90, his career is pretty much over before he's 40. It's almost as if the show biz Gods flipped a switch in 1965. I know that John has written before about his break and lawsuit with Paramount in 1965. Is this part of it? I've researched Cleveland newspapers of the era, and like Elvis, the Lewis Paramount pictures are continuously playing at drive-ins and matinees until 1970 and then both disappear. Was the increasing dependence on painkillers a part of it? Norman Lear who was a writer claims that Jerry stopped learning, maybe that was it? I've always found it interesting that Mel Brooks (also an ex-writer) is the exact same age as Jerry and doesn't hit his stride until the early 1970s, five years after you can't give Jerry away. Even today, Mel is considered comedy royalty whereas Jerry was considered a cranky has-been, particularly the last 15 year of his life. I know that Jerry was an impossible interview because one couldn't guess which Jerry would show up, but it's too bad that the decline was never addressed. It would have been very beyond difficult to approach the career decline (50 years ago) with someone who even at the end thought he was relevant. In a weird way, I find that admirable, like a fighter who still thinks he's got it. There's no denying the talent and I do agree that the television work with Dean is the best way to understand the phenomenon. Those shows are still funny. Whether one hates him or loves, like Mickey Rooney, Show Biz will never see the likes of him again. Just wanted to say two things, both reflecting upon Jerry Lewis. One is that I read in a book about composer Randy Newman that his dad, who was a physician...well, first, a brief background about that, that's also amusing. His dad's name was Irving Newman. He was one of the several younger brothers of nearly paternal oldest brother and Hollywood legend, pianist/executive/composer/conductor Alfred Newman, the man who could truly do it all. You still hear Newman's music if only his Fox logo signature tune, even on Fox News! (Which I avoid like the plague.) As you know, of course. And Randy told his biographer in the case of his dad that Alfred advised Irving NOT to go into music, when he was still young enough to choose, because everybody else in the family had already done so, and they didn't need another musician in the mix. So, Irving became a doctor...really, a doctor "to the stars", evidently. Randy said he had quite the clientele in Beverly Hills, but finally to the punchline. The one celebrity who tried to come see him who he absolutely refused to take on board was...gee, you guessed it: Jerry Lewis. The second thing. My uncle Bob, my dad's brother, was a pilot most of his life. First with the USAF, then he became a commercial pilot, from TWA to the West coast courier PSA (Pacific Southwest Airlines), now defunct, BOTH of them! And by the way, Bob is NOT defunct; he's 93 years old. Once I got to talking with Bob about whether or not he'd ever flown any celebrities in his time, and he said there had been a few. I'm pretty sure I did NOT ask him which one was the worst! I don't think that question even would have occurred to me. He VOLUNTEERED that one celebrity in particular was the worst. You want to try to guess who it was? Oh! You guessed it AGAIN! Yes...Jerry Lewis. Stinky has a respect for comics who'll do anything for a laugh, even if they don't make him titter - Milton Berle comes to mind. But Stinky frequently laughs at Jerry. Stinky also looks with dismay at comics he once adored, like Lou Costello and Danny Kaye, and wonders what in the world he once thought so funny. But not with Jerry Lewis. As for Dean and Jerry, there's no question who's the funnier and more talented. Dino, naturally, who Billy Wilder once called the funniest man in Hollywood.